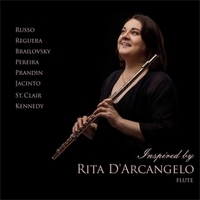 The famous Italian flutist Rita D'Arcangelo presents world-premiere recordings of pieces inspired by her art. A must-have for flute aficionados and audiophiles. Highly recommended! "Rita D'Arcangelo plays with a beautiful tone and remarkable technique. Added to this is a musical poise and sensitivity that touches the listener when she plays." A new recording project is always a challenge and, at the same time, a unique and a nearly magical moment in a musician’s life. Genuinely, this particular recording is very special and dear to me. Over the past ten years I have been very honoured to have many new flute solos written and dedicated to me by extraordinary contemporary composers. With time, they have become my dear friends, as well. I had for a long time the idea to collect these beautiful compositions on a single CD and it is with great joy and emotion that I present them to you here. Joseph Russo (born in 1953), a contrabassist and a composer, studied with Robert Starer and Vincent Persichetti (among others) at The Juilliard School and with Luther Noss at Yale University, attending composition/music theory classes at both schools. Joe has developed and continues to develop his own personal melodic and tonal compositional style. He has composed numerous chamber and orchestra works. “Romanze” for flute solo with its beautiful melodic line was written for me in October 2016 and I performed its world premiere at Yamano Music Hall in Tokyo, Japan in April 2017. Daniel Olguin Reguera, a guitarist and a composer based in Argentina and formed at the great school of Conservatorio de Música de Mercedes and Conservatorio de Música Alberto Ginastera. He is currently a music teacher in the province of Buenos Aires. The beautiful five movements of this composition resound and remind of the atmosphere and the flavours of the Argentina´s capital and bring the listener really there. The “Cinco Improvisaciones sobre Buenos Aires” were written for me in 2011 and revised in 2013. I performed their world premiere in August 2018 at Chieti Classica Festival in Italy. Michael Brailovsky, PhD (born in 1937), a musicologist, a pianist, and an arranger, graduated from The Leningrad State Conservatory of Music in 1966. He emigrated to US in 1979; his research papers on Mozart, Sibelius, and Karl Orff were published by leading Soviet musical publishing houses. His Piano Quartet after Beethoven's Piano sonata A major, op.2, No. 2 was recently published in St. Petersburg. Mily Balakirev composed his virtuoso piano Fantasy "L' Alouette" in the form of variations after M. Glinka's Romance for voice and piano of the same title. Michael Brailovsky arranged it for me in 2016 and I performed its world premiere at Dalet Concert Series in Princeton, New Jersey, in October of that year. Vasco M.N. Pereira (born in 1956) a pianist, a composer, a conductor, and an educator, studied in Portugal and Spain where he completed his studies in Gregorian Chant and Conducting at the prestigious Real Conservatorio Superior de Música de Madrid. In addition to his international activity as a composer, he has been very active as a music teacher as well. “Atlantico” was written for me in August 2012 and it echoes the beauty and the mood of the Atlantic Ocean in summer. I also had the privilege to record it for “Diapason”, the classical music program of the Vatican Radio, in November 2015. Roberto Prandin (born in 1953 ) a flutist, a conductor, and a composer is present on the international music stage in concerts and lectures in Europe and the USA. He held a position of a professor at The State Conservatory in Cesena, Accademia delle Belle Arti-Bologna, Università per Stranieri-Perugia in Italy and The Boston Conservatory in the USA. For several years he conducted the international concert tours of the legendary Italian flutist Severino Gazzelloni. The beautiful “Tizzy” was written for me in Berlin in July 2015. I performed its world premiere at Klassische Musik bei Maria Frieden concert series at Maria Frieden Church in Berlin in January 2017. Javier Jacinto (born in 1968) is a graduate of Conservatoire of Music of San Sebastian and a graduate of Orchestral Conducting, as well as of Composition for Real High Conservatoire of Music of Madrid. Currently he reconciles his artistic activity with his educational work. He collaborates with The General Society of Authors and Publishers (Spain). “Cadenza for a Concert” was written for me in 2009 after Javier heard my performance of J.Rodrigo´s “Concierto Pastoral”; likewise Concerto represents a great challenge for the performer. I performed the world premiere of “Cadenza for a Concert” at Shimogamo Jinja Temple in Kyoto, Japan in November 2010. Richard St. Clair (born in 1946), a pianist, a composer, an educator, and a poet. He earned his Bachelor, Master and PhD Degrees in Composition at Harvard University. He has been a piano instructor at The New England Conservatory and later a composition instructor at his alma mater, Harvard University. The beautiful “Karmic Dancing” was written for me in 2013 in five movements with an extraordinary character and shape. I performed its world premiere at the 42nd National Flute Convention of the NFA in Chicago, USA in August 2014. John M. Kennedy (born in 1960), a contrabassist, a conductor, and a composer is a professor of Music Composition at the California State University in Los Angeles. He is a recent recipient of Fulbright Scholar Award, supporting his invitation from the University of Malta to teach Music Composition and seminars on American music in the spring of 2017. The touching “Yer” (rev. 2012) was written for me in Malta in the summer of 2012, where I met John at The International Music Festival. It is an original arrangement of the flute and piano version which was also composed for me the year before. I had the privilege to perform the premiere of “Yer-2012” at Manoel Cultural Heritage Theatre in Valletta, Malta in July 2012.